Art Gallery of Ontario (AGO) in Toronto, Canada is under construction for a Frank Gehry addition. By looking at the architectural model on display, one does not get the impression that it will be a blockbuster attraction like his Guggenheim in Bilbao, the Walt Disney Concert Hall in LA, or the Millenium Park in Chicago. It is an acknowledgement that Gehry was born and brought-up in this city. However the addition has been called Gehry-lite, due to the understated structure financed by a relatively small budget. During the construction, a limited portion of the permanent collection is on view (mostly Impressionist paintings), including the largest collection of Henry Moore sculptures in the world. What's interesting is that the AGO invited British artist Julian Opie to draw figures on the walls of the Henry Moore sculpture center. You will remember Julian Opie from one of my MArch posts covering the Margulies Collection in Miami. Here Julian Opie created drawings of a stripping pole dancer surrounding the walls of the Henry Moore sculpture center. Named, This is Shahnoza, the drawings were conceived from photographs and videos of a real dancer, taken in the artist's studio. Julian Opie's trademark stick-figures create a playful dialogue with the serene sculptures of Henry Moore. Whereas Henry Moore's female figures exude elegance and gravitas, Julian Opie's drawings are cheeky and light. You will also notice that the poles are drawn under the beams of the gallery, where they seem to be supporting the ceiling. 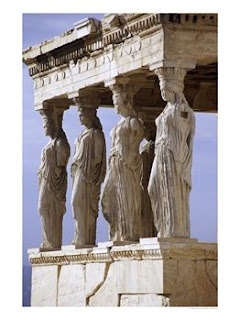 They bring to mind the caryatids used in the Greek period as columns to hold up ancient temples (example below). The inter-generational dialogue with a master sculpture from the '60s and the historical/architectural reference make this temporary installation a unique experience.